No one was injured in the collision, which took place at 11.20am today. A man and woman suffered cuts after being threatened with a flick knife outside a Dewsbury pub. The altercation happened at The Old Turk in Wellington Road at around 11.40pm on Saturday evening. The main victim, a 53 year-old man, was in the pub with friends when he became involved in a verbal disagreement with a group of three men. 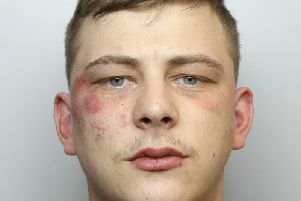 He went outside and one of the men slashed at his t-shirt with a flick knife causing the victim to suffer cuts to his arm and hand. A 49-year-old woman tried to intervene and suffered a small cut to the arm. The man with the knife is described as white, around 5ft 7ins tall, of stocky build, with short black hair. He was wearing a red top. The second man is described as white, aged in his mid 50s, around 5ft 9ins tall, with a beard. He was wearing camo-style pants. It is understood that he stayed in the pub during the incident outside. The third man is described as white, aged in his mid 20s, around 5ft 11ins tall, with short brown hair and stubble on his face. He was wearing a black leather vest with ‘England’ written on the back, jeans and a checked shirt. He is described as being in the doorway during the altercation outside. The three men all left the area on motorbikes shortly after the incident. PC Paul James, of Kirklees District CID, said: “We understand that a band had been playing at the pub that evening and there were still a number of people around when the initial altercation has happened inside the pub and then during the resulting incident outside.